But it can't be from Dolly Clackett. She gave me an Easter egg! : Oh, everyone knows Go, Johnny, Go, Go, Go, Go....It’s like a cross between Hoover and Eight Men Down. Oh, everyone knows Go, Johnny, Go, Go, Go, Go....It’s like a cross between Hoover and Eight Men Down. I thought about writing a blog about how hideous the end of last week was, but I decided against it. Because, although it was pretty bad, it's over now. And also this week is nearly over, so it would be OLD news, so you've all been spared that sorry tale! After a pretty intense few weeks, things are starting to look up a bit. I was in London today but was able to get home from work at a decent hour and Nic met me at the station in actual daylight, which was quite a thrill. Work is still going to be busy for the next month or so, but I think with a few more spaces in between the really intense periods, which will make life easier. It helps so much that the people I work with are so great, I feel genuinely lucky to be working with such a motivated and kind and interesting group of people and although the past few weeks have been very tough I don't at all regret the change in jobs. I've had some good news from home as well, my granddad is out of hospital and my dad has been able to see him. This is a great relief to me because, as worried as I was about granddad, I was very worried about Daddy. He seems to have found a strategy for dealing with the stuff that has been going on with his siblings, and he feels much more positive as a result. Talking to him today reminded me of how alike he and I are in how we react to stress and the things that make us feel stressed. The main thing that was upsetting him last week when granddad was ill was not knowing what he should do for the best, and the indecision was paralysing, and I am just the same. Usually once I have decided on how I am going to deal with something, however difficult, I feel better about it. This is something that has contributed to the upswing in my mood, in fact. Having been faced with a fairly difficult situation over the weekend myself, finding a way to approach it that seemed right has made me feel like a weight has been lifted, and for that I am very grateful. I couldn't help but think how apt this was just right now. Anyway, moving on! It's time for me to go and make my dinner now. No outfit shot today, I've got London all over me and am not feeling particularly photogenic. 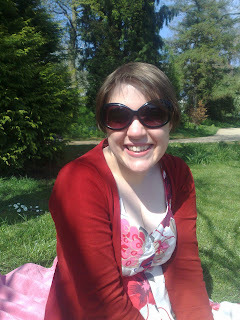 Instead, here is a photo Nic took of me last summer, while we were enjoying a picnic in Jephson Gardens. It's starting to feel warm enough and spring-like enough that I can daydream about lazy summer afternoons spent in just this way, so here is a photo to get us going.